When we first heard that American Horror Story Season 4 would have a carnival theme, our first guess -- or fear -- was that a scary clown would be included. Because in a drama series this creepy, with a planned carnival theme in the works, a scary clown seems not only inevitable, but also kind of required, right? Sure enough, co-creator Ryan Murphy has confirmed that American Horror Story: Freak Show will feature a clown that's "the most terrifying clown ever." It's Pennywise may beg to differ, so we'll see about that. EW got the update from Ryan Murphy on what's ahead for American Horror Story: Freak Show, which is centered on a 1950's Florida "freak show" run by Jessica Lange's character, who's German. In addition to confirming the presence of a very scary clown, whose name is actually Clown Killer, Murphy also revealed that there will be a bearded lady involved. Or their "own version" of a bearded lady. So there may be some kind of twist on that. 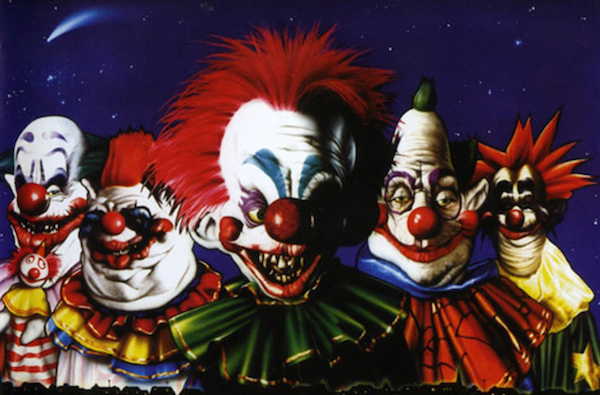 Clown Killer, not Killer Klowns! Tim Curry's performance as Pennywise the Clown in the 1990 miniseries based on Stephen King's It sets the bar for terrifying clowns though, so American Horror Story has its work cut out for it if its clown wants to give us those kinds of nightmares. We know that Jessica Lange will return for American Horror Story Season 4, and we also learned back in March that the great Michael Chiklis will be joining the series to play "the former husband of Kathy Bates' character and father of Evan Peters' character." Right, Evan Peters and Kathy Bates will also apparently be back. Bates only joined the series last season for American Horror Story: Coven. The anthology series' cast fluctuates each season, with some actors returning each year for new roles, while others depart (or in the case of Taissa Farmiga, leave and come back again). And there are usually one or two newcomers to the fold, which is the case for Chiklis this year. Hopefully we'll hear more confirmations on casting in the coming weeks and months leading up to October.